Hello. I just ordered a couple of second hand jerseys that have been lying in the basement for roughly 20 years (according to the previous owner). One of them is the red jersey. It has the tag in the collar similar to the 96-97 you show here, but it says this instead: “Authentic Athletic Apparel Assembled in Costa Rica of U.S. Components fiber content on reverse.” Does it still mean it is a 96-97 jersey? The other one is clearly a european version produced in Italy size M. Any way to determine the year of these jerseys? I cannot find any date/year in any of the tags. Hey quick question, I recently bought a 91-92 from eBay but noticed that when I received it the sizing seems pretty off. It’s a 48 but definitely does not measure up to my other 48s I have. Is this normal? Hey man just wanted to thank you for this site its amazing! ive spent the last 2 hours reading all your articles and its so informative! i had a pretty good base knowledge before as ive collected over 100 different champion jerseys but wow compared to you im a noob! so my question was about a jordan black replica i have. It says made in the US, and has no neck tag which i find interesting. Unless the previous ripped off the neck tag perfectly, but also the bulls didn’t start wearing black alt jerseys until 95-96 right? I’m trying to figure out what year to place this jersey. Thanks again! You’re correct, the Bulls didn’t start wearing black alternate jerseys until the 1995-1996 season. But, although Champion moved a bulk of production to Mexico starting in the 1995-1996 season, there were still jerseys issued that season that were made in the USA. Particularly rookie jerseys (like Jerry Stackhouse), teams that had redesigned jerseys (like the Rockets or the expansion Raptor and Grizzlies) and teams that had new alternate jerseys (like the Bulls or Bucks). These would have been issued prior to the start of the 1995 season due to demand and to get the new designs in the hands of fans before the season started, and therefore would have been produced in USA plants. So you have an early run of a Bulls Jordan alternate jersey from the 1995-1996 season. I’m trying to pinpoint the year of my jersey. I have the larger blue tag but it says made is USA, with the stitches NBA logo, and the jock tag also says made in the USA. I have a Michael Jordan jersey that has to be a 96-97 version to 98-99 version range. But it says “assembled in Costa Rica of U.S.” not Mexico. Everything else matches up exactly. Any thoughts? I have several others Champion jerseys and this is the only one like that. 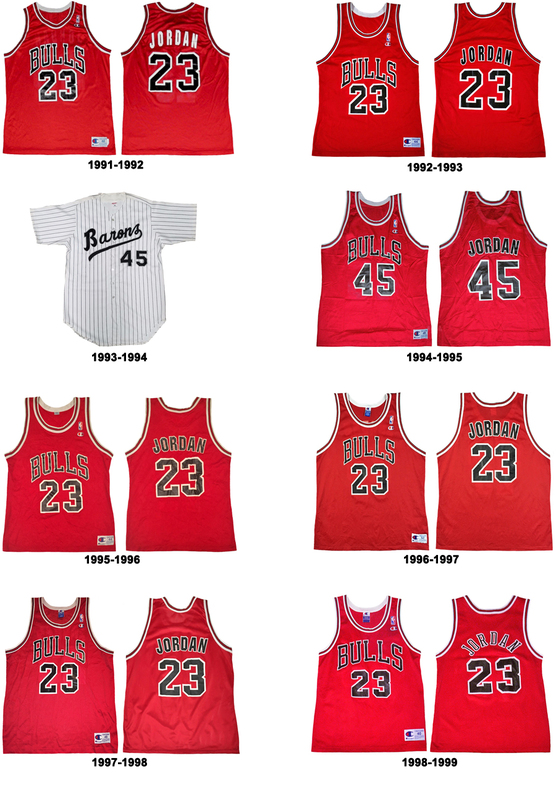 Was there ever a Michael Jordan Champion Bulls Rookie NBA Jersey made for the 50th season.